Welcome to another edition of the Ohio State Football Recruiting Notebook. While the last week was pretty uneventful in the world of Ohio State recruiting, things are about to pick back up – as Friday Night Lights, one of the biggest recruiting events of the year, is tonight. One of the top offensive linemen in the 2014 class, who was once considered a Buckeye lean, is probably headed to another school. There were also a couple of recruits on Ohio State's campus last week. One of which is one of the top players in the 2015 recruiting class. We will also talk about tonight's Friday Night Lights camp, where a lot of Ohio State's top targets and commits will be in attendance. There were also a few players who held offers from the Buckeyes that committed to other schools last week. Finally, we'll take a look into future Buckeye recruiting events at the end of the notebook. Scranton (PA) Lackawanna Community College offensive tackle Jermaine Eluemunor is very close to announcing his final decision between UCLA (currently committed), Arkansas, and Ohio State. Up until a few days ago, I felt this race was trending towards the Buckeyes. However, Eluemunor's visit to Arkansas, last week, went well, and the Buckeyes no longer appear to be the front runners for the standout tackle. I think he'll commit to Bret Bielema and the Arkansas Razorbacks in the not too distant future. Ohio State played host to a couple of visitors in the last week, with Rockwall (Texas) running back Chris Warren and St. Louis (Mo.) Christian Brothers College offensive linemen Brian Wallace. Both players hold offers from the Bucks. Warren, who hails from the high school football talent mine Texas, is regarded as one of the top players in the 2015 class. He checks in as the number 78 player in the 24/7 composite rankings. There was a lot going on inside the OSU football program while he was in town, but the visit went well, and the Buckeyes have put themselves in a solid position with the Lone Star State standout. Just got done visiting THE Ohio State University. All I have to say is I was very surprised by everything and everyone! Wallace has flown under the radar to this point in the recruiting cycle. 24/7 Sports ranks him as a four star recruit. While he reportedly holds an offer from OSU, and the visit went well, I doubt he'll end up playing his college ball in Columbus. I think Iowa is his leader right now, and the Buckeyes' offer probably isn't committable. The week's biggest news item is tonight's Friday Night Lights camp, which will bring many of Ohio State's top targets to Columbus. The biggest names in attendance will be: Raekwon McMillan, Curtis Samuel, Marshon Lattimore, Erick Smith, Myles Autry, Eric Glover-Williams, Joshua Alabi, Mike Weber, Jayru Campbell, Jerome Baker, and a host of other big name recruits. 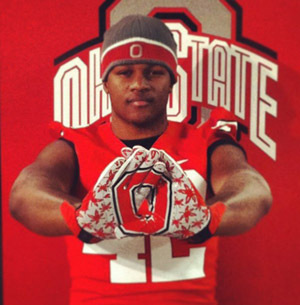 McMillan might be the biggest visitor, as the Buckeyes are in a close, three-team race to land the star linebacker. I'm still under the impression the Buckeyes lead for McMillan's services, but I know Alabama made up a lot of ground this summer. This is a huge visit for the Bucks to impress their top remaining target on the defensive side of the football. Brooklyn (NY) Erasmus Hall athlete Curtis Samuel is another top OSU target who will be in attendance. The speedy athlete received glowing reviews at Nike's "The Opening," earlier this month. The Buckeyes definitely hold the lead here, but I doubt he pulls the trigger and commits just yet. The Cleveland Glenville duo of Marshon Lattimore and Erick Smith are a couple of other big names who will be attending. Right now the Buckeyes lead for both of these players, but I think they will decide closer to National Signing Day. I'm pretty confident that both will end up playing their college ball in Columbus. Myles Autry is a name that hasn't come up in a while, but he had OSU as his leader at one point in the recruiting process – he still says Ohio State is his "dream school." It will be very interesting to see how the Autry visit plays out. A host of elite 2015 prospects will be working out at the camp. The headliners include Eric Glover-Williams, Jerome Baker, Joshua Alabi, Mike Weber, Jayru Campbell, Andrew and David Dowelll, along with many other top juniors. It will be interesting to see what these recruits think of the camp. Ohio State' 2015 class is expected to be a big one, as a lot of players are set to graduate after the 2014 season, and the scholarship restrictions are set to expire. Jeremy, Jordan and Mike will be bringing you live coverage from the event. You can check out the full list of visitors here. There were a couple of players who the Buckeyes had offered or expressed some interest in that decided to commit to other schools in the last week. First Norcross (Ga.) linebacker Kevin Mouhon committed to the Tennessee Volunteers, last Saturday. While he held an offer from the Bucks, and visited with teammate Lorenzo Carter late last month, there was never a good chance he'd up in Scarlet and Gray. Phoenix (Ariz.) Desert Vista defensive tackle Jalen Jelks committed to the Oregon Ducks on Monday. Jelks grew up rooting for the Buckeyes, but OSU never extended him an offer. He should be a good one for the Ducks. Ohio State's summer camps are set to come to an end with the Friday Night Lights camp, and we're about to enter a one month slow period in the world of Ohio State recruiting. We won't see many visitors or commitments in the month prior to football season. Things will pick back up with the start of Ohio State's football season, Saturday, August 31, when the Bucks take on the Buffalo Bulls.